The Flash‘s season-long Flashpoint story arc has been frustrating, to say the least. Barry’s journey into the mopiest timeline has sucked a lot of the life out of what once was an effervescent show that featured a hero whose powers were a joy rather than a burden. The episode opens with the kind of grim overtones normally reserved for a solider going off to fight in an unwinnable, unpopular war. Barry is the solider marching into the Speed Force to save Wally. There’s an unspoken feeling that there’s a good chance Barry isn’t coming back from this one. Along the way Barry meets the Ghosts of Speed Force past – Eddie Thawne, Robbie Raymond and Leonard Snart – who all made the ultimate sacrifice somewhere along the way. It’s all an object lesson for Barry that the universe has a plan, but that he should let events unfold rather than try to manipulate them, and that he should do his own dirty work rather than have others do it for him. During the battle, Barry loses his inter-dimensional tether and Jay Garrick, is called upon for the rescue, and to fulfill the cosmic rule that one speedster must occupy the Speed Force prison that Future Barry built at all times. “Into the Speed Force” is the sour cherry on top of this cake baked with misery. In the aftermath of Barry’s return, Barry is convinced he has to beat Savitar on his own; Wally has been rendered useless by his ordeal in the Speed Force prison; Jesse Quick has to return to Earth 3 to fill Jay Garrick’s shoes; Barry pretty much breaks up with Iris and the rest of the team is just left hanging. 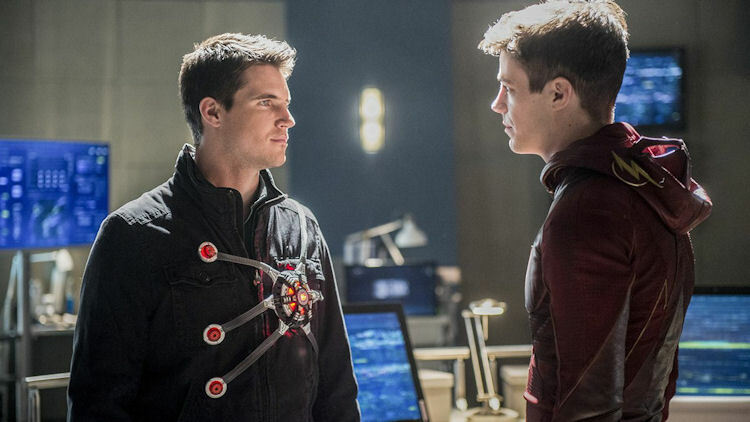 These developments are supposed to tug at the heartstrings, but they only prove to be more aggravating because save for Jesse’s discovery about Savitar’s weakness, 15 episodes of character development and plot momentum have been effectively undone and we’re stuck where we started – Barry against the world with only his speed and his crippling guilt to help him. But hey, the musical episode is next week so, that’s a good thing, right? Next story Life Red Band Trailer: Is Jake Gyllenhaal Hiding a Secret?